DCS by Fisher & Paykel is a pioneer of the professional kitchen equipment. They produce a full range of both outdoor and indoor kitchen equipment. We are a company specializing in DCS appliance repair of any ranges, wall ovens, cooktops, microwaves, warming drawers, range hoods, refrigerators, dishwashers, BBQ grills and outdoor heaters. Our experienced technicians are factory trained and certified by DCS. 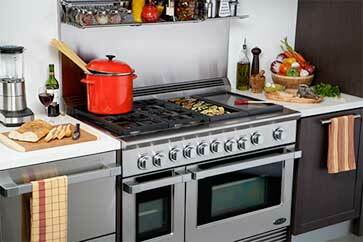 We perform repairs, installation, and service for all types of high ticket item and European kitchen equipment. Our team works harder, faster and most efficiently than anybody else. Besides exceptional skills and knowledge, we also offer you the best customer service. People who work for us are always polite, knowledgeable and ready to help you. They will go out of their way to keep you satisfied. We offer a accurate estimate for every project, flexible appointment scheduling, and same day appointments. Our company gives you a two-hour window to make it more convenient for you as well as courtesy call. We are so sure of our work that we offer you a 3 yearwarranty on all parts with your repair project. Ask us about our special deals and discount. Top Home Appliance Repair is a well-trusted company with more than 30 years of experience in appliance repair. We are family owned and family operated. We do a professional job at very reasonable prices. There is not a brand or a model of kitchen or laundry appliance that we can not fix. Our service area includes Los Angeles, Ventura County, Marin County and East Bay area. We do both commercial appliance repair and residential appliance repair. Our friendly customer service will make DCS appliance repair a comfortable and convenient experience for you. For DCS appliance repair give us a call or complete our short contact form and we will book a convenient service appointment for you. Our qualified technician will be heading your way really soon. He will bring with him all the tools and parts necessary for your particular job. Once he is at your house, he will get working right away. He will figure out what is wrong with your DCS appliances and find the best solution. He will do everything replaces parts, clear filters, run tests, etc. Finally, the job is done. Our technician will perform the final safety test and make sure that he is handing over to you a perfectly working appliance. After this is done our DCS appliance repair specialist will clean up after himself and dispose of all the old parts. He will share with you tips on how to best maintain your appliance. We also offer annual or bi-annual maintenance program. With this service, we can come and do all the maintenance for you. We will prevent small problems from becoming big issues. Also, you will not have to worry about changing filters on your appliances. We will do it for you. This service will save you time and money. You can rest assured that your DCS appliances are in the hands of professionals. We are the most qualified to do DCS appliance repair for you. Our technical team is factory trained and certified by DCS company. We know the latest technology that goes into DCS appliances. Our technicians are always up to date in terms of their skills and knowledge. Also, we use the most advanced repair tools. We carry all the DCS genuine parts with us. It does not matter how complex the problem is, out experienced technicians will be able to solve it fast. Our customer service is one of the best in the industry. We treat our customers with respect and value their time. Our workers are always polite and friendly. Your DCS appliance repair service appointment will be easy and convenient for you. Before you know it, you appliance will be fully functional again. We guarantee it! For DCS appliance repair, please call us at 925-265-7782 in East Bay or 628-214-0064 in Marin County. Or you can fill out our short contact form. We would love to talk to you and answer all of your questions. Besides DCS appliance repair are also certified to repair Asko, Bertazonni, Bosch, Dacor, Electrolux, Fisher&Paykel, Frigidaire, GE, Jenn-Air, KitchenAid, La Cornue, LG, Liebherr, Marvel, Miele, Perlick, Samsung, Siemens, Sub-Zero, Thermador, Traulsen, True, Viking, Whirlpool, Wolf. DCS by Fisher & Paykel is a pioneer of the professional kitchen equipment. They produce a full range of both outdoor and indoor kitchen equipment. We are a company specializing in DCS appliance repair of any ranges, wall ovens, cooktops, microwaves, warming drawers, range hoods, refrigerators, dishwashers, BBQ grills and outdoor heaters.